foods – You Asked It! Are Pesticide Residues a Risk? Each year, the Environmental Working Group publishes the “Dirty Dozen” report of foods that test positive for pesticide residues. While these foods may show pesticide residue is present, the risk is negligible. The Environmental Protection Agency (EPA) tolerance levels for pesticide residues is protective of human health. Test results are at levels well below tolerances set by the EPA. Drs. Carl Winter and Josh Katz of the Department of Food Science and Technology a the University of California-Davis are leading experts in the issue of pesticide residues. Before you know it, county fair time will be here! 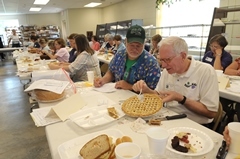 It is time to recruit volunteers to be judges for the Foods and Food Preservation project. Classes are now scheduled and are open to potential judges, foods leaders and youth. Contact the host county for details and registration.